www.vintagefashionlibrary.com: To top it all off. I am a hat person. I love them. I think they create a style all their own, or they can just finish off something that's almost there by itself. Hats are unique. The nice thing about vintage hats is that anyone can wear them. Most vintage clothing is fairly small, so it can be hard to find something that fits well, unless one has a smaller frame than average, by today's standards. Well, I'm not so sure, but I think that hat sizes have stayed fairly standard, meaning that vintage hats are much more likely to fit. Good thing, since it's virtually impossible to alter them! 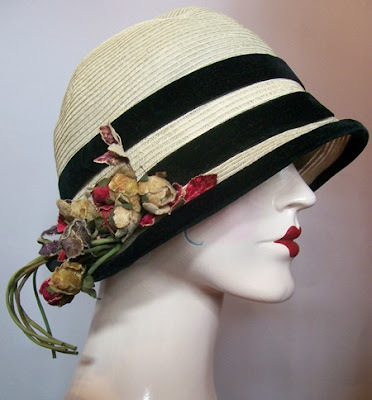 Take this 20s hat, from Dorothea's Closet Vintage. Check out her selection of hats -- she had some featured in September, 2009's issue of Vogue, and for good reason. This one is classic 20s, and I covet it terribly. Great thing is, it could be paired just as easily with a dress as with a pair of jeans and a boyfriend jacket. Love it? Me too. My thoughts about hats today came about when I found a quote by my beloved Erma Bombeck, whose humor is pretty similar to my own. "I have a hat. It is graceful and feminine and give me a certain dignity, as if I were attending a state funeral or something. Someday I may get up enough courage to wear it, instead of carrying it." I hope she did. This particular chapeau is just stunning; I love cloches, and I love straw hats. The flowers and velvet ribbons are just the perfect touches!